How is Quality Coffee Produced? What are the importance of each step in the chain? What steps in the chain are most important for us to invest in to get quality results? How can we assure quality production from a given set of farmers? These are the questions I've wrestled with ever since my business partner and I began to put our life savings on the line in 2000. Early on we identified essential quality investments and invested with the farmers with profitable returns. 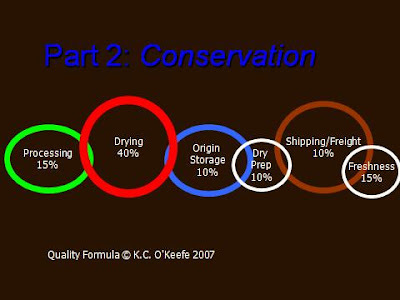 Since those early days I've been working on a model to access farmers/exporters quality potential at each step in the chain. Beyond that I've wrestled with a theoretical model of projecting the quality outcome found in the cup. The following is a brief introduction to that model, "The Quality Formula". 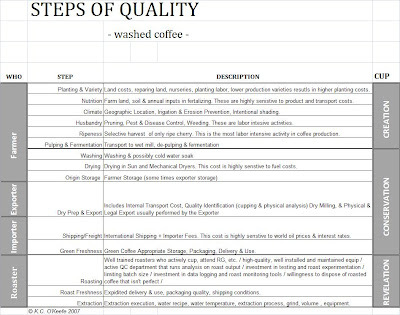 The basic question we ask is how much weight should be assigned for each step in the specialty coffee delivery chain. 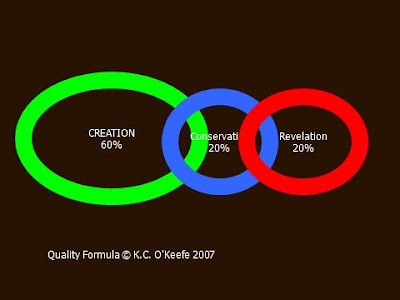 The chain is broken into three macro-links; Creation, Conservation & Revelation. These macro-links are then broken into micro-links who's total weighted score produce the macro-link score. You can see each of the macro-links weighted value in the first slide. This is not an absolute science and will never be. On the other hand we have empirical evidence that this model is roughly accurate. I’ve been working on this for several years and have presented it to colleagues in several countries who have contributed to arriving at the current version. The model is meant to be a tool to determine where to invest in the coffee chain with the greatest potential impact on our coffee quality. These weighted values are theoretical, and are meant to give us a relative perspective of the importance of each step. 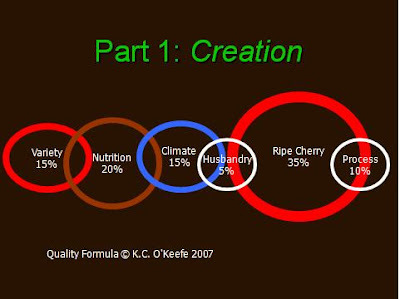 Of course quality can be completely ruined at every step in the chain. . . .
Quality is created from the Seed being placed into the ground until the fruit is picked off the tree. Once the Creation link is passed the quality potential is defined. This is primarily in the hands of the farmer. This is similar to the Photographer taking a picture, capturing the beauty of the moment. 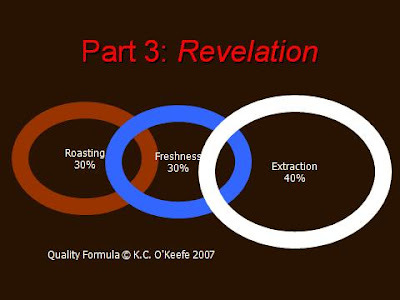 This portion of the quality model represents 50% of the total quality found in the cup. The primary role of Exporters and Importers is to conserve the quality that was created by the farmer. This includes finish drying to delivery to the roaster. Conservation is the photo film which carries the image. Its kept on that role in a dark environment and delivered to the developer in a little black case. This critical step can be coffees ruin, but when done appropriately represents about 20% of coffees total cup quality. The Roaster & Retailer reveal the quality that was created by the farmer and conserved by the Exporter and Importer. This is the photo developing room. Some photos are developed poorly with over exposure, underexposure or simply with poor materials that don’t reveal the clarity of the colors and images. Finally at the end of this chain we enjoy a great cup of coffee! Bellow is a definition of each step of the quality chain. The law of no returns; there is nothing we can do to change a prior step. Each step in the chain limits the potential quality flavor outcome of future steps. Consequently, the first steps are the ones of greatest importance in the purposeful creation of quality. Part 2 - in depth explanation of the formula coming soon.